I finally made it to ChiKo -twice- and thankfully my hyper-ventilating has ceased and my breathing has now slowed to manageable pace. ChiKo’s menu is a combination of Chinese and Korean food; hence the name. 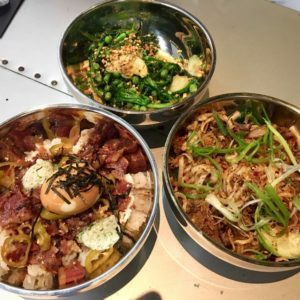 The fast-casual restaurant comes from a well-known trio of chefs/restaurateurs who recently formed The Fried Rice Collective. 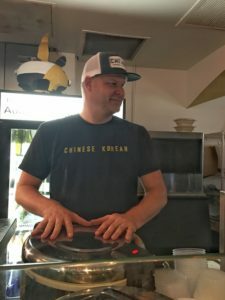 Chef Danny Lee is chef and owner of Mandu, a popular Korean restaurant he opened in 2006 with his mother. Chef Scott Drewno was previously executive chef at The Source by Wolfgang Puck, where he was honored with numerous awards during his 10 year tenure. Andrew Kim is the co-founder of the successful Matchbox Food Group. This is quite a bit of star power for a fast casual restaurant. But don’t let the fact that you order at the counter cause you to underestimate the food. This is destination-worthy cuisine. In fact ChiKo was just included on Tom Sietsema’s Top Ten Favorite DC Restaurants in his 2017 Fall Dining Guide, landing at #8. 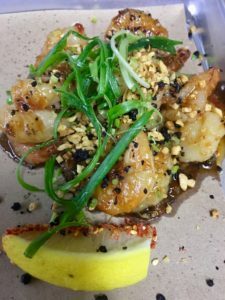 While chefs Drewno and Kim collaborate on dishes, each one is a modern take on Korean or Chinese, rather than a fusion of cuisines. Instagram obsessives like me know what to expect before stepping foot in the restaurant. Two popular meaty dishes on the relatively compact menu are the sumptuous Wagshal’s Chopped Brisket and Cumin Lamb Stir Fry. 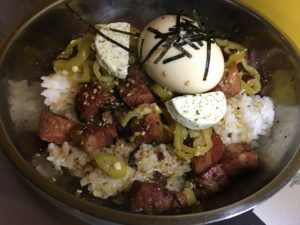 Wagshal’s brisket – a cross between corned beef and pastrami- is chopped and scattered atop a bed of rice, with a soy brined soft egg, furikake butter, and pickled peppers. The ingredients converge into one powerful dish- the kind that lingers on in your memory for days. Cumin lamb stir fry with wheat flour noodles and caramelized shallots is a solid challenger to the brisket. I waiver between which dish I prefer; both benefit from creative juxtapositions of stellar ingredients. In two visits I’ve been able to conquer a respectable portion of the menu. Orange-ish chicken receives lavish praise by Sietsema. The chicken is lightly fried and mildly spiced. 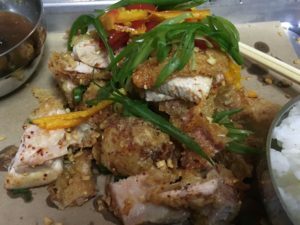 Part of the fun is picking through pieces of chicken, candied mandarins, and crispy garlic, off a metal tray lined with paper. Peel and eat shrimp provides a welcome respite from some of heavier fried dishes. The combination of garlic XO sauce and chili lime results in a lip smacking treat. At first glance the menu appears challenging for a vegetarian, but my husband finds plenty to enjoy in the half-a-cado salad dressed with citrus soy, breakfast radish, and crunchy almond slivers and umami-rich wok blistered pea shoots with toasted sesame oil and aged soy paste. A review of ChiKo’s Instagram feed reveals that there is now a Meatless Tuesday with specials like mushroom mapo tofu and butternut squash porridge. 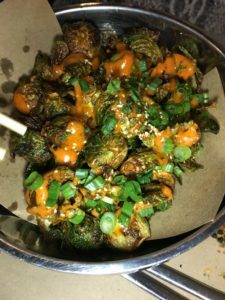 Korean-spiced brussels sprouts make an appearance as a special. Stay… please. For those who are lucky enough to snag a seat (30 days in advance) there is a $50 tasting menu that will introduce you to most of the offerings. Reservations aren’t easy to come by, but if you pay attention to social media, last minute openings are possible. In addition to patrons who fill the small space, the demand for take-out is clearly booming. ChiKo also offers catering. It’s great to see chefs Lee and Drewno working the line, while Kim facilitates operations, serving and schmoozing. This may not be the case for long, as this talented group has positioned their company for expansion. I apologize if I have induced ChiKo FOMO with this post. I understand the pain, but the remedy is simple. Make a visit to ChiKo to alleviate the symptoms. You may, however, need to repeat the treatment again and again.